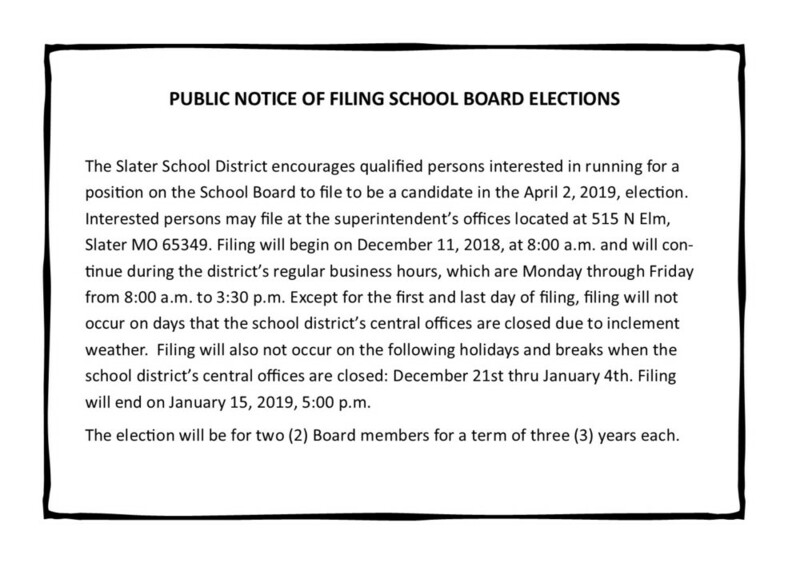 The Slater School District encourages qualified persons interested in running for a position on the School Board to file to be a candidate in the April 2, 2019, election. Interested persons may file at the superintendent’s offices located at 515 N Elm, Slater MO 65349. Filing will begin on December 11, 2018, at 8:00 a.m. and will continue during the district’s regular business hours, which are Monday through Friday from 8:00 a.m. to 3:30 p.m. Except for the first and last day of filing, filing will not occur on days that the school district’s central offices are closed due to inclement weather. Filing will also not occur on the following holidays and breaks when the school district’s central offices are closed: December 21st thru January 4th. Filing will end on January 15, 2019, 5:00 p.m. The election will be for two (2) Board members for a term of three (3) years each.